In the following examples, I will be using the NodeMCU development board and will program it with the Arduino software. Hopefully you have already set-up your ESP8266 development environment and were able to load the blink sketch. If not please follow this tutorial first. The ESP8266 can communicate over WiFi in two different modes. It can connect to an existing wireless hot spot, or access point, similar to the way you connect your phone or computer to the Internet. This is called “station” mode. In station mode the ESP8266 board can reach out to the internet and may also communicate with other devices connected to the same network, including other ESP8266 modules. Here is a simple example. Remember to replace the values for the ssid and password variables with the name and password for your wireless network! 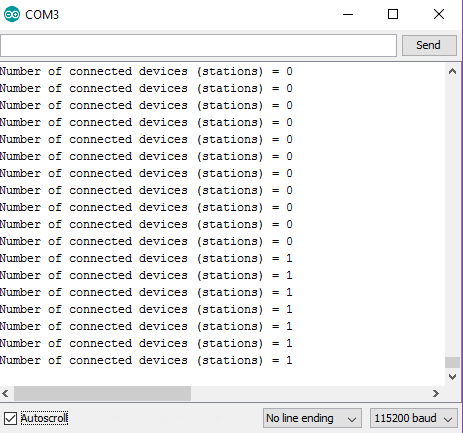 If you have access to your router admin screen, you should see the ESP8266 module in the list of connected devices. Now if you open the Wi-Fi connection menu of your phone and check the available networks, you should see a new one in the list. If you left the default settings in the sketch above, it will be called ESP8266. Connect to it, using the password in the same sketch and check the serial output again – you should see the count for devices connected increment. That is all! The ESP8266 is also able to operate both in station and soft access point mode at the same time. If you have two ESP8266 devices, you can make one be a station and the other an access point and they will be able to communicate with each other. Followed all of your tutorials up to this one and specifically “ESP8266 WiFi station mode example” and got the results you indicated I would get. However on this topic, I got a library not found on “#include “. OOPs, I just realized the board on the IDE had changed to an UNO when I rebooted. It does compile now. Sorry for posting my error. Very useful tutorial! Me and some friends are on a degree project, I wondered if the soft access point could be used not as an open network but as a VPN. Context : we’re designing an app that would connect to the hidden VPN to transfer technical data, without other phone users being able to see the hotspot. Also, does the ESP8266 works standalone, or can it be connected to an Arduino Uno R3? Best reagards from France, please answer quickly! 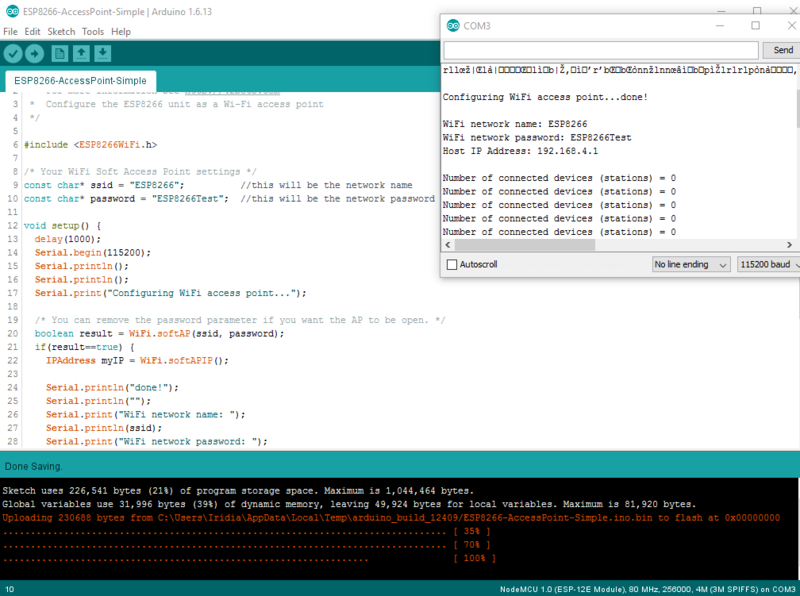 How to send data(string) from connected server to ESP8266 wifi module to see in serial monitor ? Thanks, Amazing tutorial!!! Very simple! 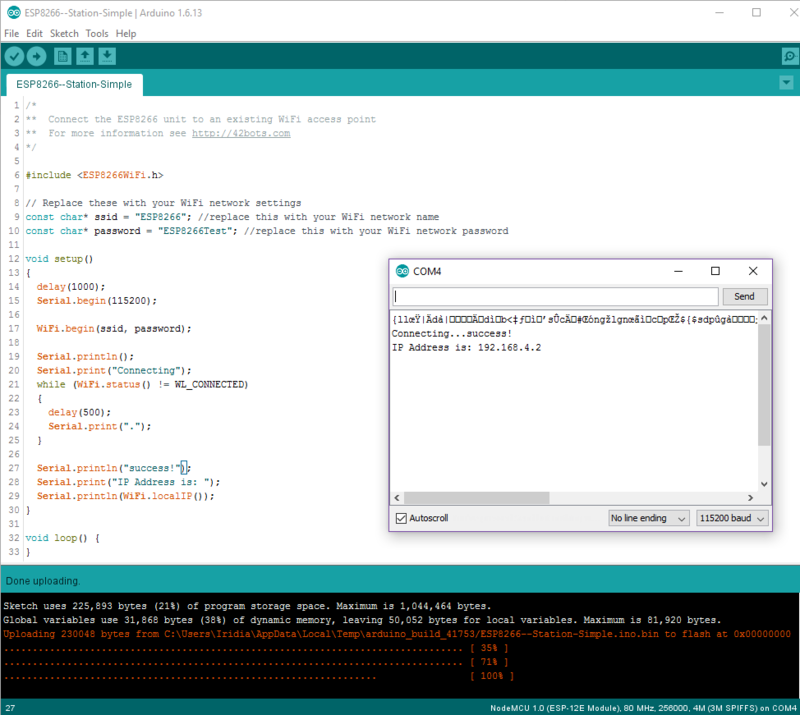 how to set serial ssid and password esp8266 nodemcu?? ?